His siblings took off, but he had other plans. 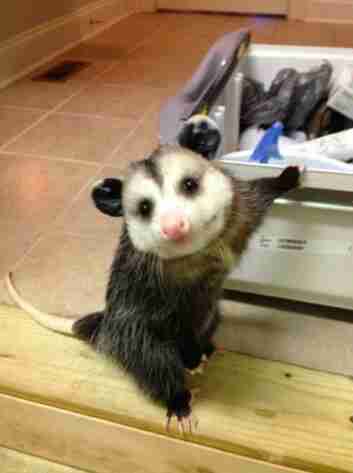 The three baby opossums were orphans. Two lost their mother to a car accident. The third, to a dog attack. 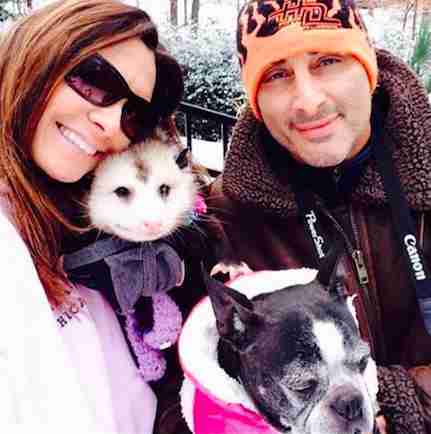 Opossum rehabilitator (and dog rescuer) Sheri Kassalias agreed to foster the three - to nurse them back to health, and take care of them until they were big and self-sufficient enough to be released back into the wild. Two of the babies went along with this plan just fine. They were willing to be rehabbed - and more than happy to be released. The third had other ideas. "Opie was so sweet he demanded to be held. He climbed up my sleeve," Kassalias tells The Dodo. Opie even began licking and grooming Kassalias, a cat-like behavior called "slubbing." 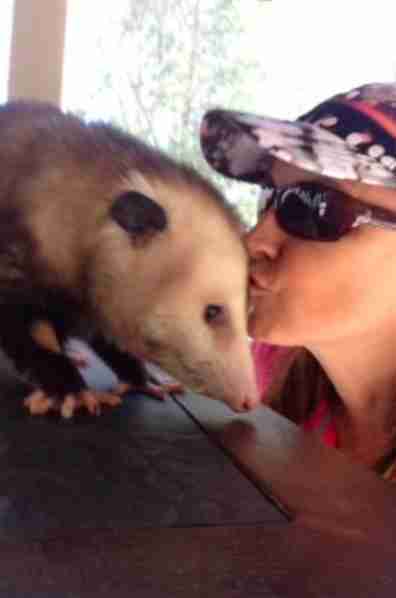 Another rescuer told Kassalias she had a "one in a million" opossum, due to his friendliness and how quickly he'd bonded. The rescuer said that she would either have to completely cut off all contact with Opie, in an effort to make him releasable - or else commit to keeping him forever. "So here we are almost two years later," says Kassalias. 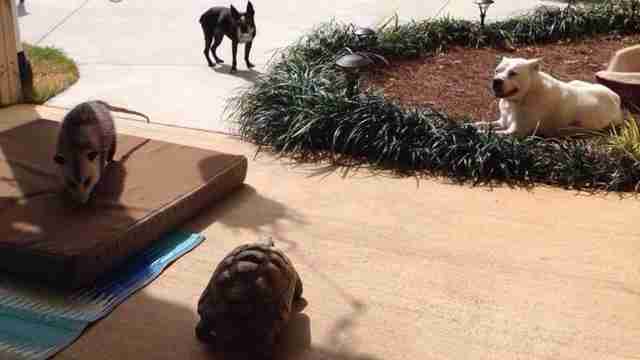 Opie is now fully part of the family, sharing a home in South Carolina with Kassalias and her husband, plus a 14-year-old pit bull, an elderly Boston terrier, a 25-year-old tortoise named Bubba and a foster dog. 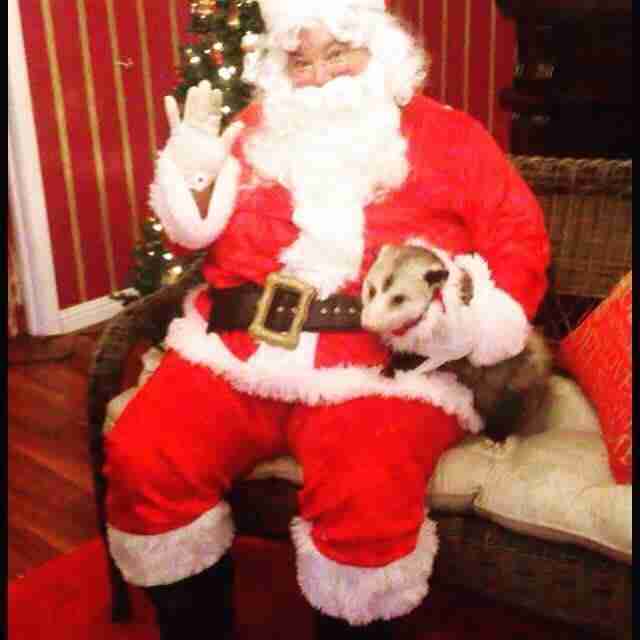 Just like the others, Opie gets treats and walks - and visits with Santa. Opie has another job, besides being a treasured companion. He is registered with the USDA so that he can appear in public - he travels with Kassalias to schools and other places to help educate folks about the wonders of his kind: Ancient creatures who are North America's only marsupials, opossums are not susceptible to rabies and eat lots and lots of ticks. 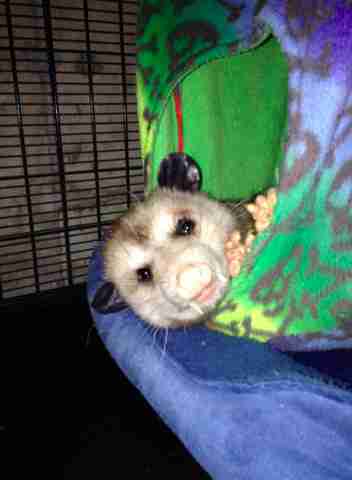 Kassalias likes to tell people how opossums will eat the pests out of your yard without destroying anything in return. They will not dig up your property, or climb into your attic. They will stay on the ground and "appreciate an abandoned hole under a tree log, a spot in the back of the garage or an open area to your basement," she says. "I love that they give back to nature instead of taking from it. They are gentle even when injured." Opie also helps draw crowds to dog adoption events by appearing as a special guest, and he's starred in a charity calendar. "He is an amazing ambassador," says Kassalias. 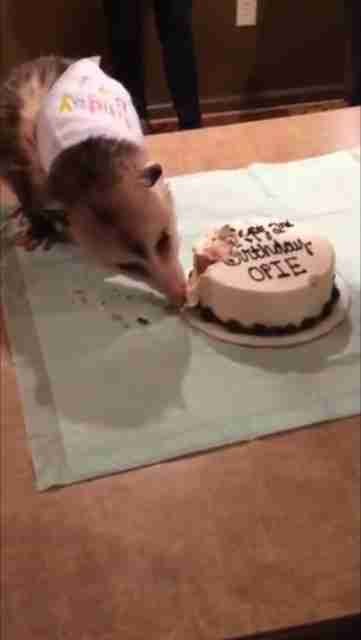 Opie's recent second birthday party was a big event. 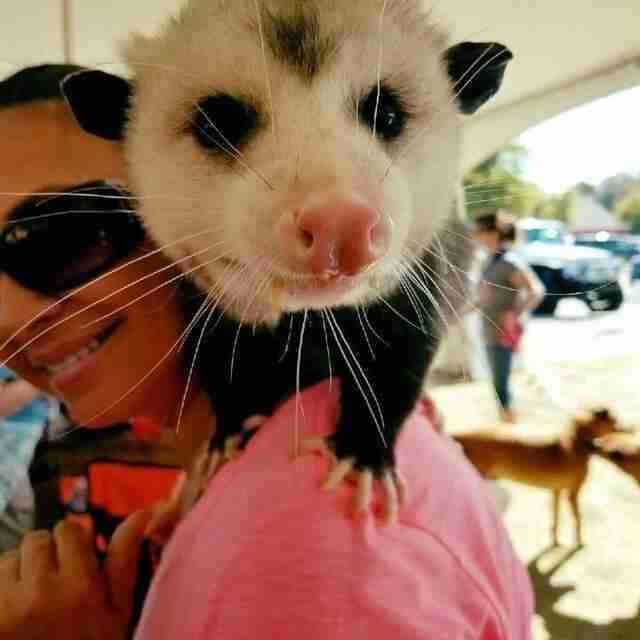 He got a special cake for himself, made of bananas, carrots, and blueberries - and his party was a fundraiser for The Opossum's Pouch Rescue, and brought in hundreds of pounds of donated food, plus blankets and other supplies, for the rescued animals. But celebrating Opie's second birthday is also bittersweet. 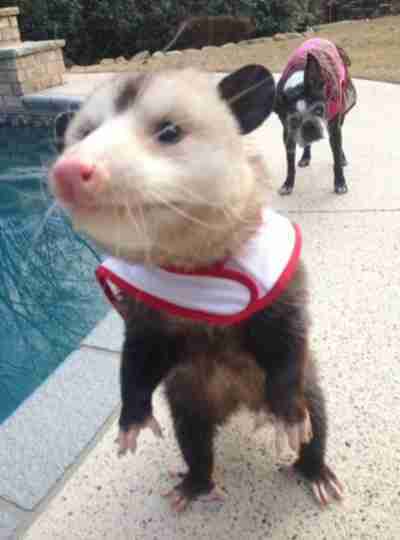 An opossum's lifespan is unlikely to be much more than two years. Opie is showing some signs of slowing down. He's having a little trouble with his balance, and he's lost a bit of weight. The other night, Opie sat in Kassalias' lap while she cried over the thought of losing this magical marsupial, whom she calls her "positive possum." Opie has brought so much joy to her life, while doing so much good for others. "Regardless of how much time I have left with him, I know I have done absolutely everything in my power," says Kassalias. "If his longevity was based on love, he would live to be 100."